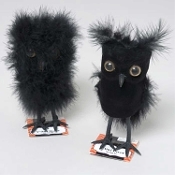 Cute little dimensional polystyrene Bird shapes, fuzzy flocked and decorated with fluffy marabou feathers. Brown acrylic eyes and black plastic beak and bottom wired legs to easily position or for easy attachment to Halloween wreaths, tree branches, crafts projects, gift packages, haunted house graveyard fences, potted plants, drapery rods, floral arrangements, table centerpieces, etc. Set of 2 Gothic Haunted House Ornaments MINI BLACK OWL Props and Halloween Party Table Decorations. TWO (2) styles per SET, as pictured.